White for health care professionals. I also saw something about a Green mass for farmers, but I don't think that's official yet. Black mass would have a pretty bad connotation. We do have a polka mass, it's not a polka-dot mass - that would be strange, although not a lot stranger than a polka mass. But, my question is, are these "Color" masses celebrated in the entire Church or are they an American novelty (and if so why are the celebrated in the USA)? How universal are the “colour” Masses in the Catholic Church? It would seem that that the so called "Colour Masses" are not universally commemorated, but are somewhat popular in some countries and/or amongst those who are connected within certain spheres of employment that are subject to these Masses. The colours employed at Mass do not always correspond with the title in question. The liturgical colour of the Blue Mass is always white. Blue is the colour that often associated with police officers and that is why it is called the Blue Mass. The liturgical colours of these Votive Masses remain true to liturgical decorum. Many of these so called designated Masses are associated with certain saints, even when the Votive Mass is that of the Holy Spirit (red). At present I have permission from my Local ordinary to publish a document entitled A Journey through the Year with the Church which is a collection of Catholic traditions at either a local and/or universal level. In chapter 15, on subject of Moveable Feasts, Practices and Traditions, I listed a number of votive Masses that could be celebrated on no fixed date within the liturgical year. Some of them concern these various Masses. The first recorded Red Mass was held in Paris in 1245. In modern times each country has its own date in which to host the Red Mass if they choose to do so. Nevertheless each diocese or parish may hold its own Red Mass Day on any particular date that is liturgically free to do so. This is especially true if the parish church dedicated to St. Thomas More, patron saint of lawyers. One of the better-known Red Masses in the USA is celebrated at the Cathedral of St. Matthew the Apostle in Washington D.C. Since the Supreme Court convenes on the first Monday of October, the Red Mass is celebrated on the Sunday before the first Monday of October. It is normally presided over by a cardinal. In Ireland, the Red Mass is celebrated on the first Monday of October, which is the opening day of the Michaelmas Law Term. The Red Mass is often associated wit St. Thomas More the patron saint of all statement, politicians, lawyers and people in public life. Even though it it the votive Mass of the Holy Spirit, it is precisely for invoking the guidance of the Holy Ghost on those in public office that this tradition has started. Holy Spirit, guide us in all our ways. The liturgical colour or the Gold Mass is white. The Gold Mass is relatively new and is not yet very popular, but as time moves on it may increase in popular devotion. The Gold Mass may celebrated annually in the Catholic Church since 2016 for Catholic scientists. The first "Gold Mass" for Catholic scientists was held on November 15, 2016, in the chapel of the Massachusetts Institute of Technology (MIT), in Cambridge, Massachusetts. The sponsor is the Society of Catholic Scientists, which was incorporated in the summer of 2016 in the territory of the Archdiocese of Philadelphia. The color gold was chosen because it represents the alchemy of science and it is the color that is worn at graduation ceremonies (on the hood of those who are being awarded bachelors, masters, or doctoral degrees in the academic discipline of science). The date of November 15 was chosen because it is the feast day of St. Albert the Great, a Dominican Doctor of the Church who is the patron of scientists. Although on the Votive Mass in honour of St. Albert white vestments are to be used, one is free to use gold coloured vestments on this occasion. “Cloths of gold” can replace can replace the liturgical colours of white, green and red. This is permitted so due to its’ intrinsic value as a rare metal. The liturgical colour of the Blue Mass is white. 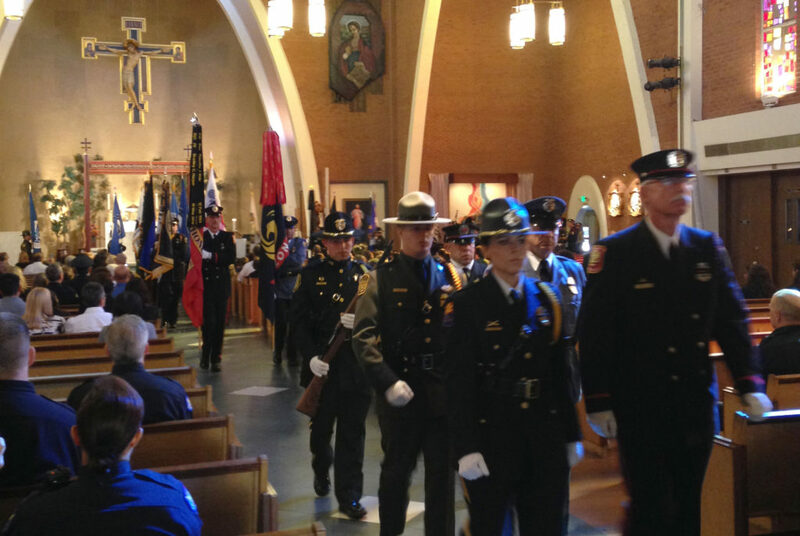 The Blue Mass is a Mass offered for the intentions of all first responders (police, fire fighters and paramedics). It gets it term of the Blue Mass from the fact that most first responder’s uniforms are blue. This Mass can be said any day of the year. In the USA, President John F. Kennedy, in 1962, declared May 15 as Peace officers Memorial Day and the week in which May 15 falls as Police Week. As a result, many places in the USA hold their annual Blue Mass sometime in early May. A more natural choice for other countries would be a votive Mass of St. Michael the Archangel, who is the patron saint of first responders. September 29 is the feast day of St. Michael the Archangel and seeing that the month of September has been traditionally dedicated to the Holy Angels a date within this month would be most appropriate. St. Florian, patron saint of firefighters, pray for us. The liturgical colour of the White or Rose Mass is white if the votive Mass is in honour of St. Raphael and it is the same colour if a Mass is said in St. Luke's honour. The White or Rose Mass is a Mass said for the intentions of both doctors and nurses. The term the White Mass comes from the colour of both doctor’s and nurse’s uniforms. When a Mass is said for the intentions of nurses only, it is called a Rose Mass. Once again, this sort Mass may be celebrated on any day of the year which is liturgically free to do so. St Raphael the Archangel is the patron saint of both doctors and nurses. What has been said about St Michael the Archangel can apply to St Raphael the Archangel also! Some parishes celebrate this Mass on or around the Feast of St. Luke the Evangelist, who is also the patron saint of doctors. The liturgical colour of the Green Mass is white. The Archdiocese of Atlanta will celebrate its third annual Green Mass for all who volunteer or work in “green jobs” or environmental sustainability, and for all those who love planet earth, on Thursday, October 4, the Feast of St. Francis, at 12:10 p.m. This Mass will be held at The Catholic Shrine of the Immaculate Conception, 48 Martin Luther King Jr. Drive, SW, Atlanta, Georgia 30303. Bishop Ned Shlesinger will be the celebrant. We invite you to join us for this special Mass, on the feast day of St. Francis, as we share in the beauty of God’s creation and pray for those who work diligently to protect our planet. You are also invited to join us for a luncheon following the Mass featuring Georgia grown produce. Not the answer you're looking for? Browse other questions tagged catholicism tradition liturgy mass church-local or ask your own question. What are some of the benefits of going to church? When are lay men and women permitted to proclaim the Gospel in a Catholic church? Is there a way to help choose a Catholic Church?